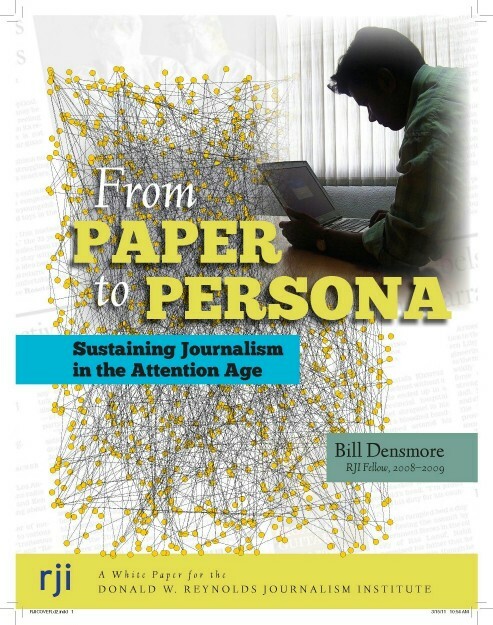 In the white paper “From Paper to Persona,” we use the term: “information valet” or “infovalet.” “Valet” may not yet bet the perfect metaphor, it’s the best we’ve come up with to describe the change necessary for news organizations to morph and grow in the new news ecology of information abundance. decade ago, but to me that sounds too much like a spy, and with the increased concern about privacy it seems the wrong metaphor now. And concierge, which might be better, is too long. Paying for access to information by subscription, per click or per item. Receiving value for viewing or accepting commercial offers, such as advertising or reward points. Real-world analogies to the role of the “infovalet” might be to an agent, broker or retailer, with the important attribute that the InfoValet’s economic interests are principally aligned with the individual consumer or buyer of services, rather than with the seller. However, an infovalet might have different roles for difference transactions. For example, a news organization operating as an infovalet to readers, viewers or users might be solely their curator or agent for finding trustworthy information and services on web or mobile platforms. However, the news organization might promote its own content to its own users. The ideas of agency, and economic interest are not clear cut. A retailer, for example, might market Product A more heavily than competing Product B because it received a special wholesale buy of Product A allowing it to realize more profits vs. selling Product B. In an open market for digital information, with lots of competing InfoValets, users might be expected to favor those whose practices are most transparent and aligned with the user’s interests. These valets will compete across geographic and topical spheres with search, advice, community, research, linking, hosting, data storage and other services. They will compete to be best at meeting the consumer’s diverse information needs within communities defined by individual users. Information resources will not typically be owned by the valet. Rather, the valet will be compensated for finding, shaping and referring them to the consumer, much as a retailer aggregates and merchandises for wholesalers. A computerized, community-based ecosystem that enables consumers to opt-in to convenient, secure and private information exchange with trusted providers of online content, products and services where the relationship value of the consumer is captured and married to optimized positioning of seller offerings. Visa-like payment engine/network/capability to slice-and-dice payments, establish and enforce rules, handle problems, service customers, provide reports, administer licenses/IP, etc. In August, 2009, when I spoke in Prague on a State Department program, I asked through an interpreter what people thought about “valet.” The feeling was that it was as good as anything else, even translated into Czech. It does require perhaps a little explaining but that’s because it’s a new construct about the role of news organizations. Historically, editors thought of themselves as either delivering what readers needed to read or what they wanted to read, where want was defined in a crassly mass market “if it bleeds it leads” kind of way. This is something new. It’s about taking the time, and developing the technology, to listen carefully and learn from individual reader/viewer/user interests and preferences and then equally carefully matching those with useful, trustworthy information. Converging with some of these ideas are the work of experts in the field of network identity, security and authentication. Searls, Kaliya Hamlin, Mary Ruddy and Drummond Reed are behind the Identity Commons, and the related Internet Identity Workshop – ongoing meetings in Silicon Valley among researchers and technologists working on trust and identity frameworks for the web. The Identity Commons has received some backing from major companies, including Microsoft Corp. These groups, as well as entrepreneurs like Paul Trevithick, a Wellesley Hills, Mass., chairman of the Information Card Foundation, have been advising the Obama administration as the U.S. Commerce Department determines what role the government might play in fostering user identity on the web. The agency is balancing both privacy policies with an apparent desire to preside over the adoption of digital identities issues by the private sector but compatible with the governnment’s needs. ROGER GAFKE: You have mentioned the importance of advertising as the future but in your opening remarks you mentioned a bit about micropayments and subscriptions. Would you elaborate a bit on each of those other potentials? ERIC SCHMIDT: I think you are going to end up with all three. An analogy I would offer is television — there is free over-the-air-television, there’s cable television and then there’s pay television. And they have smaller markets as you go from free to more highly paid. And that structure looks to use like roughly the structure of all of these businesses. Today there are very effective subscription-based models, but there are not very good micropayment systems, micropayments meaning 1-cent, 3-cent kinds of systems. They clearly need to be developed by the industry. So I think from your perspective you should assume that your information, if there is a category of information that you all produce that you’ll want to distribute free — freely — there’s a category of information that you’ll want to distribute on a per-click basis and then there’s some of it you’ll want subscription for. The reality [is] that in this new model, the vast majority of people will only deal with the free model and so you.ll be forced whether we like it or not, to have a significant advertising component as well as a micropayment and a traditional payment system. The technology around micropayments is getting to be possible now. The transaction costs were so high before that you couldn’t do the one-cent, three-cent kind of a model. It looks like the new technologies around aggregation will allow that at the payment level.